The Waterfront: Demo and Party Night! Hope you will all be attending our party night and acrylic demo by Andrew Hamilton next Tuesday (13th). 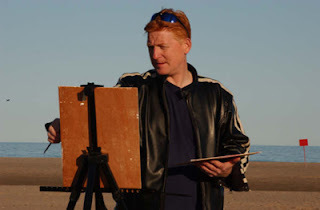 Andrew will be painting a landscape and discussing the essential elements of the Group of Seven". Andrew is an international impressionist painter, artist and workshop instructor in acrylic, oil, watercolor and printmaking mediums. His vibrant, colourful and unique work is part of numerous national and international collections. His painting style encompasses the use of a palette of the three primaries plus white and he combines this with a loose, inventive colorful style. Andrew paints in all four seasons capturing the beauty and natural rhythms of each and has painted from coast to coast traveling painting and capturing in paint this vast land. The meeting will be at the Langstaff Community Centre and the demo will start promptly at 7pm! End of Year message from our President! Artists support action against mega quarry!